When CW announced that it was rebooting Charmed, the choice was met with a bit of confusion—and even some hostility—from fans of the original series. Based on the pilot shown at Comic-Con, I have a feeling those fears are going to subside once fans get to know the new Charmed Ones. 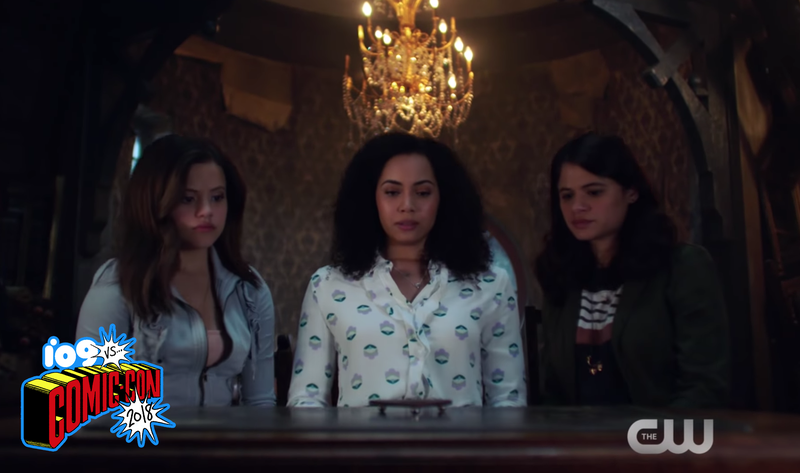 During San Diego Comic-Con, the CW debuted the pilot episode of Charmed, a rebooted version of the iconic 1990s series about three magical sisters destined to protect the world. 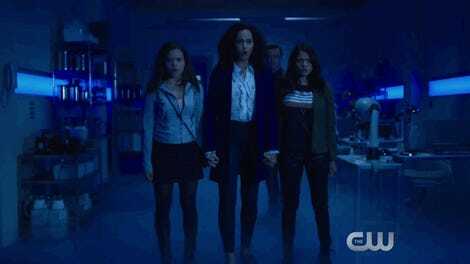 In this version, we’ve got Mel (Melonie Diaz), Maggie (Sarah Jeffery), and Macy (Madeleine Mantock) coming into their powers after the mysterious death of their mother. They band together to fight demons and face down the evils of the patriarchy... with the occasional Easter egg nod to the original series. As the episode begins, we get to know Mel and Maggie, two sisters who couldn’t be more different. Mel is an outspoken feminist and graduate student, while Maggie is a freshman who’s hanging with sorority girls at what basically amounts to an Iraq War-themed rush party. Their mother, a women’s studies professor at the local university, is reeling because the school may reinstate a professor who’d been suspended after being accused of sexual assault from a now-comatose honors student. After some “charming” exposition where their mother basically says her goodbyes, she’s attacked by a bunch of CGI crows and rolling fog—managing to cast a spell and unbind her daughters’ powers before plunging to her death outside their home. Fast-forward three months, and things are falling apart. Mel has become obsessed with her mother’s death and finishing the work she started, hoping to raise public awareness with a protest against the accused professor who’s now back at his old job. Mel’s crusades have alienated her from everyone else—including her now-former girlfriend, and Maggie, who’s distracting herself by secretly pledging the sorority. Enter Macy, a scientist who’s recently moved into town to work at the university’s lab (do any of these girls have a life outside of this school?). Her world changes the moment she steps in front of the sisters’ home: She’s been there before. Later that night, Macy goes to confront the sisters with the shocking truth that she’s probably their half-sister, showing a picture of her as a baby with their mom in front of the house. The moment Macy steps through the doorway, a lightning strike kills the electricity, a sign that their powers have been reborn. The three of them have trouble accepting this possible truth, get pissed off, and all go their separate ways. This is the moment they discover their powers; Macy teleports objects, Mel freezes time, and Maggie (in a change from the original series) hears people’s thoughts when she touches them, or vice versa. Harry gives the sisters 48 hours to determine whether they are going to accept their destiny as the Charmed Ones, or reject them and go about their normal lives. This is also a nice improvement on the original show, as the Halliwell sisters often bemoaned the fact that they weren’t given a choice. Mel wants to go all-in and live the Power of Three lifestyle, while Maggie and Macy are definitely more hesitant—Macy doesn’t believe that magic is real, while Maggie really wants to be a normal girl. Only problem: If the three sisters reject their destiny, they’ll not only lose their powers, they’ll forget they ever found each other. And, as we see immediately in this show, these three women are incredibly close, with a strong bond that comes across on screen. And I have to applaud the producers for finding three actresses who seem to merge so nicely. In the end, the Charmed Ones choose to reconstitute the Power of Three and use their powers to defeat the Demon of the Week, Tadius, who (shocker of all shockers) was actually the professor who’d been suspended for sexual harassment. Commentary! Seriously though, the show definitely reflects the politics and cultural shifts of our time, and it’s really refreshing to see a genre show dealing with modern issues. For example, there’s this running joke about consent (respectfully done, of course) that actually pays off in one of the final battles of the episode. Plus, they basically confirm that electing Donald Trump president kick-started the rise of the Source of All Evil, a character you might recognize from the original series. So, I guess we have that to look forward to. Speaking of looking forward, the pilot ends on a note of mystery and suspense, and not just with the final warning from their dead mother not to trust Harry. There’s also the growing pains of their familial relationship. In the original series, the sisters may have had some issues but they’d still known each other their whole lives. Here, much like with the arrival of Paige in season four, there’s a strange element in their family in the form of a new eldest sister. Could we see conflict between her and Mel, who’s acted as Maggie’s older sister for their entire lives? It’s definitely likely. The showrunners and cast closed the panel by chatting a bit about some of the things we have to look forward to, hinting that the girls’ powers are going to grow and hopefully expand over the course of the season. And we’ll be getting some interesting demonic forces—which executive producer Jessica O’Toole said will not only be representative of things going on in the girls’ personal lives, like Buffy the Vampire Slayer but will also reflect our modern lives and technology. For example, she said one of the monsters will be a demon that invades people’s Fitbits to drain them of life, forcing them to take steps until they die. It sounds silly, but hey, it’s Charmed. The series arrives on October 14. Was Charmed a better show about magic than True Blood?